The monumental Laocoon Group, also called Laocoon and His Sons, by Baccio Bandinelli (Firenze 1493-1560) – from the Hellenistic original brought to light in Rome on 14 January, 1506 in the vineyard of Felice de Fredis, near Titus Thermae on the Opium Hill – depicts the Trojan priest Laocoon and his two sons ensnared in the toils of the sea serpents sent by Poseidon. In the original, that as recorded by Pliny the Elder in his Naturalis Historia had been made from one single block of marble, the priest’s right arm was missing, and Vasari’s Life of Baccio Bandinelli tells us he made an arm in wax to replace the lost one and used it as a model for his copy of the Laocoon, commissioned in 1520 by Pope Leo X de’ Medici as a gift to King Francis I. Baccio made his copy using three marble blocks. He decorated the pedestal front with a naturalistic open scroll with folding lines, and the sides with the emblem of pope Clement VII: a transparent globe crossed by a ray of sun that sets fire to a tree, and the pope’s motto “Candor illaesus”. At Pope Leo X’s death the commission was suspended, and the sculpture resumed his work in 1523 after Giulio de’Medici was elected as pope Clement VII. In 1525 the group was complete, and so enthusiastic was the pope about the result that he decided to send it to Florence instead, in the Medici Palace where Vasari saw it at the end of the second corridor. It was later transferred to the Casino di San Marco and landed in the Gallery with Cardinal Carlo de’ Medici’s inheritance, probably in 1671. 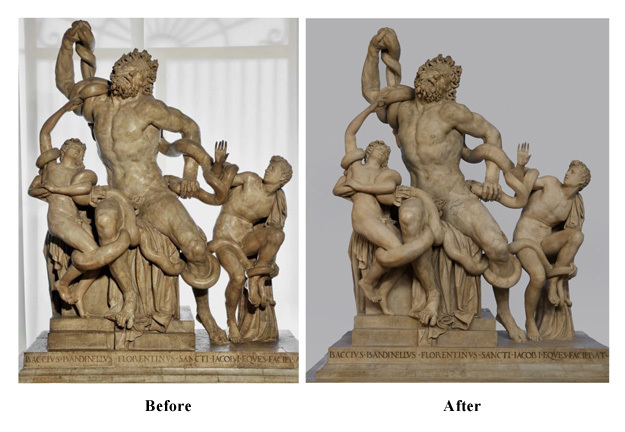 A previous restoration had been carried out after the sculpture was severely damaged by the fire that devastated the Gallery on August 12, 1762, which caused the roof over the western corridor to partly collapse, and the Laocoon characters to break up in over forty parts. Over the decades the surface had become dull and darkened by layers of dust and wax, that if on the one hand concealed the old putty and integrations, and the irreversible red stains caused by the fire, on the other hand prevented an adequate legibility of the work of art. Detailed graphic surveys were therefore realized of all the fractures, reassemblies and most relevant integrations, among which the younger son’s right arm as well as the elder son’s head and right arm. The laser cleaning has allowed a correct removal of the difficult-to-melt wax layers, while maintaining the very thin layer of patina permeating the marble surface. The white cellulosic putty used for fillings was given a watercolor gloss in the delicate stage of the pictorial integration finalized to the restitution of a surface as homogeneous as possible. “It is difficult to imagine how a Humanist could envision an ancient sculpture only through the descriptions handed down by Pliny. But in a season when the ancient was a model for the present (and even for everyday’s life) those stories must have caused vivid dreams. And so rapt and thorough were those humanists in reading the Plinian pages that they were likely to have formed an accurate and faithful idea of many celebrated yet still unknown marbles.